Up until this point in time, whenever I have put together a product review article for Surf Bunker, they have been pretty simple affairs. I take the product, give it a as thorough a testing as my limited surfing talent allows me. Take some photos. Write my honest opinion on the merits of the product, value for money, level of innovation, green credentials etc. etc. Pretty formulaic really, nothinggroundbreakingg, but hopefully making life easier for you the reader when spending your hard-earned wonga. This article was shaping up along a similar trajectory. The other fin resides exactly here which is somewhere in Portugal. A lot of surfing products, accessories more specifically are HIDEOUSLY OVERPRICED. There was a rant about to be unleashed, but on second thoughts, I am not going to distort my review of Watermarks, fantastic fins. There definitely is an article on this topic in the pipeline, however. I love fins, I love the smell, I love the smoothness, the feel of the edges and the sound they make when you clink them together. When I was told that I was the lucky chap to be testing these, to say I was chuffed to bits, is probably a massive understatement. My fins arrived in a cool little pouch, the usual type of thing that you expect from the big brands. The pouch is well made and has the separator's inside to prevent the fins from knocking together or getting scratched. The pouch has a zip and the fins fit snugly inside, no unnecessary gimmicks or wasted material. First impression of the fins was good, they felt light, and had that nice smooth feel of a new board that’s just had its final sanding. Mine came in a clear grey colour through which you can see the honeycomb core, they look pretty cool as you can see from the photos. I noticed immediately that this a well manufactured and nicely finished product. 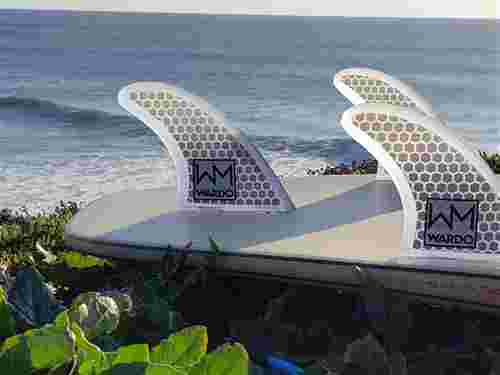 They feel equal to any of the high-end products from one of the big names is fins. All of my boards have FCS boxes and most of those are of the older style 2-tab variety. Watermark make all of their fins in the various guises that your particular craft might require, including the latest keyless tab type, four different size options mean there is no excuse to not give these fins a try. Having taken this account, I decided to give them ago in what can only be described as an everyday board: a 6'2 Firewire Sub Scorcher. This is one of my favourite surf craft at the moment, it is very predictable and easy to surf in most conditions. The predictable nature of this board is perfect for testing new skegs. Much as a love a new set of fins, I do sometimes find my self a little in disbelief, when I hear fellow surfers talking about riding different fins. Sure....top surfers, pros, guys who actually rip, the top half dozen guys in your area. These guys might notice the change in performance that an extra 1.5 mm in base length makes. Can you? Do you notice a slight change in fin foil, when you come off the bottom? Really. Ok, we can all (hopefully) tell the difference when we are riding a thruster vs a twinnie. I do change from a quad set up to a thruster set on some of my boards, depending on the waves. I rode the Watermark Wardo set for about 6 weeks, nearly every time I surfed. Mostly in head high and over, right-hand points and also in some decent beach break surf. They performed really well. They are 100% my go-to fins on this particular board. I'm not just saying this because I want to keep the guys at watermark sweet. They perform great. Tight and reliable off the bottom, predictable in turns, and nice and loose of the top. Time for the first test of the Watermarks. These fins are not particularly innovative, but I wasn't expecting them to be! They are also no more environmentally friendly, than all the other fibreglass fins out there. This really is where the Watermark Wardo model fins stand out. These bad boys are 50 bucks(US) on the Watermark website. In my book, this is insane value for money. Less than half the price of similar fins from the big players. The quality is the same, if not better, performance is great. What more can you ask for really? Plus...I love the way they look! The guys at Watermark started out with the idea of making high quality, reasonably priced surfboards for regular surfers at their local beaches. Fed up with buying overpriced products that didn’t perform for the average surfer. They have now carried that admirable ethos into the production of their fins. This is to be admired and supported. Hats off to you at Watermark and keep up the great work!!! I had a little accident with a rock, skip to the end for that. Only two fins.... thought this was a review of a thruster set I hear you mutter. Well, unfortunately, where there were once 3 there are now only 2. The centre fin now resides hidden away in the nooks and crannies of my local reef break. Most unfortunate and highly disappointing as this is from my perspective. Most disheartening is the fact that the loss of said fin was entirely my fault and totally avoidable. As anyone who knows me remotely well will attest... I am not one of the worlds ‘’early risers’’. One of the few things for which I will leave my pit is the prospect of scoring some uncrowded, half decent waves at my local reef. This wave is literally 2 minutes from my front door and with the right swell direction and tide, can be one of the best waves in Portugal. It is however very tide specific and requires a fair bit of local knowledge to catch at its best. This, unfortunately, occasionally requires one to get out of bed at the most horrendously ungodly hour. I am not at my most alert or dexterous at ‘’ridiculous O’clock’ and on this particular morning, with the waves truly pumping, indeed, right on the limit of what this spot can handle. In my haste to get into the lineup, I not only mistimed my entry but decided upon a wholly new and inventive jump off spot from which gain access to the take off zone. Needless to say, none of this ended well for me, my board or my cherished Watermark fins. The only consolation from this escapade is that my good friend and surfing buddy, Tibor. Arrived at just the right moment to witness my comical demise from the clifftop. Upon my exit from the water and disconsolately making my way back to my van for another board. The Wardo Model from Watermark Fins. Ready to go. Test Day one, some fun feelers.